Close to 34 crore children will be reached out to as part of the National Deworming Day initiative on 10th February. This was stated by Shri C K Mishra, Secretary, Health and Family Welfare,as he briefed the media about the third annual National Deworming Day (NDD) on 10 February 2017. 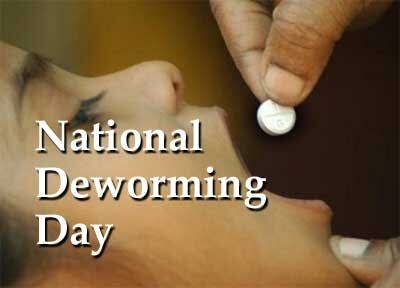 Currently the largest single day, public health program in the world, the National Deworming Day this year is set to reach approximately 34 crore children in the age group of 1-19 years in 34 states and union territories in government and government-aided schools, anganwadis, and private schools, he stated. Secretary (Health) said that a mop-up day will be held on 15 February, to deworm any child who could not be dewormed on National Deworming Day. The NDD is being implemented through the combined efforts of Department of School Education and Literacy under Ministry of Human Resource and Development, Ministry of Women and Child Development and Ministry of Drinking Water and Sanitation. All stakeholders are committed towards achievement of the NDD objectives, as reflected in the joint directives signed for NDD by MoHFW, MHRD and MWCD. The Health secretary further informed that Union Minister of Health and Family Welfare, Shri JP Nadda has also sent letters to the Chief Ministries of all States/UTs and all members of Lok Sabha and Rajya Sabha for their assistance in key tasks related to NDD. Preschool and school-based deworming programs are globally recognized as a “development best buy”. Deworming with the safe and beneficial Albendazole 400 mg tablet is an effective solution to controlling worm infections. India has the highest burden of worm infections in the world, with the WHO estimating in 2014 that over 22 crore Indian children aged 1-14 years are at risk. Intestinal worm infections can act as a deterrent to children’s growth and development, and can adversely impact performance in school, and livelihood potential later in life. In an effort to improve child health scenario of the country, National Deworming Day aims to reach every child, regardless of their socio-economic circumstance. Schools and anganwadis are ideal platforms for such a program, reaching children in their natural environment in a coordinated, cost-effective, and systematic way. In addition, through extensive awareness generation and community mobilization efforts at state, district, and community levels, children who are out of school, live in hard-to-reach areas, and are from vulnerable populations are also mobilized to be dewormed at anganwadis on National Deworming Day. Also present at the briefing were Shri A K Panda, AS&MD, Smt. Vandana Gurnani, JS (RCH,IEC) and other senior officers of the Ministry along with representatives of the development partners.